So you're like me and don't have 3 full weeks to spend taking the slow route through Lofoten, eh? Say no more. If you're willing to have a couple of "car days" to see as much as possible, you can see much of Lofoten in a short trip - and even have a couple of 'relaxing' days thrown in, to really bask in its beauty. No need to cash in all your vacation days. One of the best comments I've heard about Lofoten was from one of the owners of Manshausen, where we stayed early in the trip. Our new friend, the ever-wise Jesper told us, "everyone comes to Lofoten and immediately goes right to it, where they are at the base of the big mountains - but I think you absolutely must also spend some time looking at it from a distance." I couldn't agree more. Imagine going to Half Dome in Yosemite and only standing on the top or at the base of it. You probably wouldn't appreciate it as much as if you had also seen that iconic photo of it in the distance, in the Yosemite Valley would you? Lofoten is kind of the same way. My advice: spend a bit of time out, then a bit of time in, a little time on the water, and you'll appreciate Lofoten and its surrounding areas for all of its different facets. Plus, if you go in the winter like we did, there isn't a whole lot of outdoor adventuring because it's just too darn cold, so you have a lot more time / desire to drive and see the sights. We flew to Bodo from Amsterdam, which seemed like the best starting point for our journey, given we were first heading to Manshausen. Some people choose to do the Lofoten roadtrip 'clockwise', but we were advised to do it 'counterclockwise' so that's what we did. We arrived late at night, but you may have a bit of time to explore Bodo before starting your journey, so I've included a few Bodo recommendations here. Otherwise, try to stay in Trygsaven the first night. We got an early start on the day and drove from our apartment home [we stayed at Tuvsjyen Saltstraumen] to Saltstraumen, to take in the views. Saltstraumen, as mentioned above, is a natural phenomenon and is the world’s strongest maelstrom. Supposedly the best time to go is in the morning, so we grabbed a coffee at the adjacent Saltstraumen Hotel, parked our car under the bridge down the hill, and watched the currents. Pretty neat, if you catch it at the right time! After not too long, we were ready to go. Biggest tip before you leave the area? Make a pit stop at the COOP grocery store in Trygsaven to get snacks; mini marts and food shops could be very hard to find hereafter on our trip (in the winter, some were even closed on certain days). After a quick stop, we were off to Nordskot! Nordskot is a very, very small coastal Norwegian town, where you will park your car [unless you've used public transportation to get here, which is possible.] Jesper or Astrid, the owners of Manshausen, will then come to pick you up in the island boat to bring you to Manshausen Island. Something to note: if you don't want to partake in all of the meals at Manshausen (for example, dinner costs extra every night), you have the option and the facilities to cook on your own, as each seacabin is equipped with a full stove and a loaded kitchen. We opted out of a few meals, including lunch each day, and appreciated having this option. With that said, a tip: stop again at the small shop in Nordskot where you can pick up some goodies/snacks or easy-prepare meals, especially if you didn't stop at the COOP in Trygsaven. You will appreciate having the option later! If nothing else, grab a few of the local Norwegian candies for when you need a sugar rush. The experience on Manshausen is meant to be all inclusive, and the fact that you are isolated on a very small island only reinforces this point. The meals are slow, local and divine, and you are sure to enjoy great company whether from fellow guests (after all, you have to be pretty awesome to make a trek to this place), or from the owners themselves. We enjoyed just being, and taking in our surroundings, with no true agenda. Hours would melt away each day, which is how I knew this was exactly the place I needed to be. We were treated to absolutely incredible views of the Northern Lights both nights that we were there and enjoyed both photographing them from outside of the sea cabin, as well as from our humble abode within. There aren't too many places where you can lay in bed and fall asleep to views of the auroras bouncing over your head, so the experience is not (and never will) to be taken for granted. Truly infreakingcredible. We got up and enjoyed a leisurely breakfast looking out over the water at Manshausen. Breakfast was abundant, and highlights included fresh bread made on site, local jam, local fish, smoothies made from local fruit and vegetables (are you seeing a theme here?). After saying our goodbyes to Astrid and Jesper who by this point felt more like friends than hosts, we were soon ready to be escorted back to Nordskot, as we needed to be on our way for a big day's road trip. We drove from Nordskot to the Skutvik ferry (timetables HERE) and were soon on our way to our first destination truly IN the Lofoten Islands: Svolvær. Henningsvaer is known as the "Venice of Lofoten" and lived up to its name. Plenty of fun shops, restaurants, and stunning 360 degree mountain views, as you walk along the water. I think I like this Venice better. Everything around you, literally. Pay attention to the painfully cute details on the buildings, water, and the fisherman working away all around you. The best views here are just the everyday ones. Supposedly, you can hike up Glomtinden, a short and steady walk up (419m) which ends with terrific views of the Lofoten Islands (we didn't do it due to weather). Because we had a golfer in tow, we threw in a little drive over to Lofoten Links on the way out of town, even though it was slightly out of the way. Though they were closed for the winter, it was very fun to see and try to imagine how beautiful the course would look with the ocean views during the summer. Must go back. From there, it was onto the ever-so-charming town of Bostad, the home of the world's most northernly surf school. Same rules apply today: we cruised through each town pretty quickly to see the views and get to Hamnoy/Reine while it was still light out. Again, those towns boasted the best views and food, so snack during the day, and save your eyes and appetite for later! Not much else to see here... carry on. 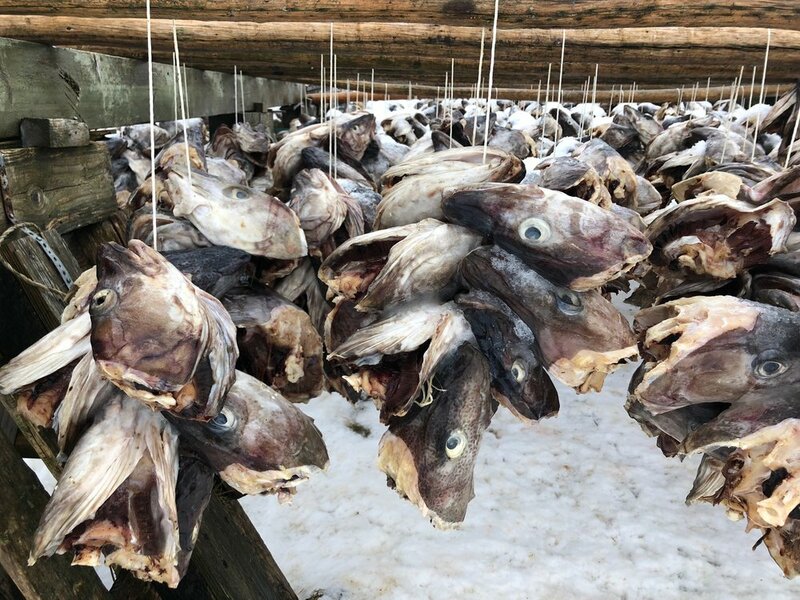 Walk around and observe all of the drying fish in each town - by the end of the trip, you will likely be tired of seeing dead fish though! Eliassen Rorbuer - while some of my other recommendations are up to you to take or not, this one is a non negotiable. 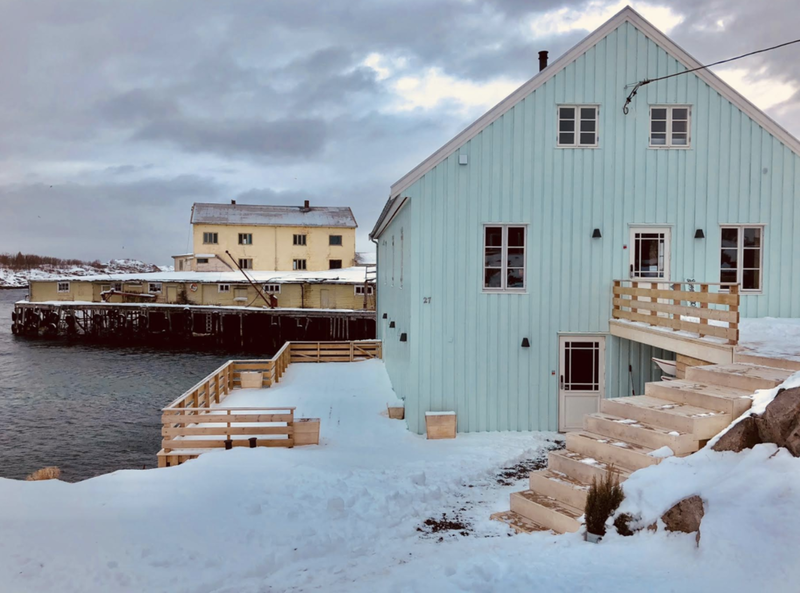 Staying in a refurbished old fisherman's cabin was an absolute highlight of the experience - right down to the cold, windy night we endured when an unexpected snow storm blew through. This is one not to be missed! We took the Moskenes ferry to Bodo (about 3.5 hours long), and upon arrival at the terminal, found that we were only 20 minutes from the airport, which allowed us ample time to fill up the tank with gas (there is a Shell station on your way to the airport from the ferry terminal), return the car, and get to our flight! You can access our Google Map counter-clockwise trip map HERE. If you’ve seen them before, you know that the northern lights seem to have two extremes: 1) a light green hue in the sky - faint, but visible to the human eye, and 2) ABSOLUTE UNEXPECTED CHAOS; when the lights start to dance and vertical lines emerge from the black of night in such a way that purples and pinks surface in waves. In this stage, virtually anything can happen - and no two experiences are ever the same. You know you’ve reached peak Northern Lights snobbery when you become arbiter of which lights are worth leaving the cabin for. But after freezing my fingers off photographing impeccable auroras the prior night, a light hint of green beams reflecting across the channel just wasn’t enough to justify emerging from the balminess of the indoors. Luckily, Manshausen Island is one of the only places in the world where you don’t have to choose between comfort and auroras. The island, situated 100 km above the Arctic Circle, contains only four cabins (soon to be seven, as new ones are in development) jutting out into the Grøtøya strait, each with floor to ceiling glass windows, from which you can take in the lights (or sunrise/sunset). Manshausen is run by a lovely young couple: Astrid and Jesper, who moved to the island together as their own personal adventure only last year. These forces of humans are as important to the island as the land itself. She cooks, organizes, handles guests – you name it. He – a former mountain guide – does the other half of the duties. Partners in the truest sense, they have unmistakably made Manshausen their home and have become one with the place. And it’s contagious: while there, you feel as though you should too. 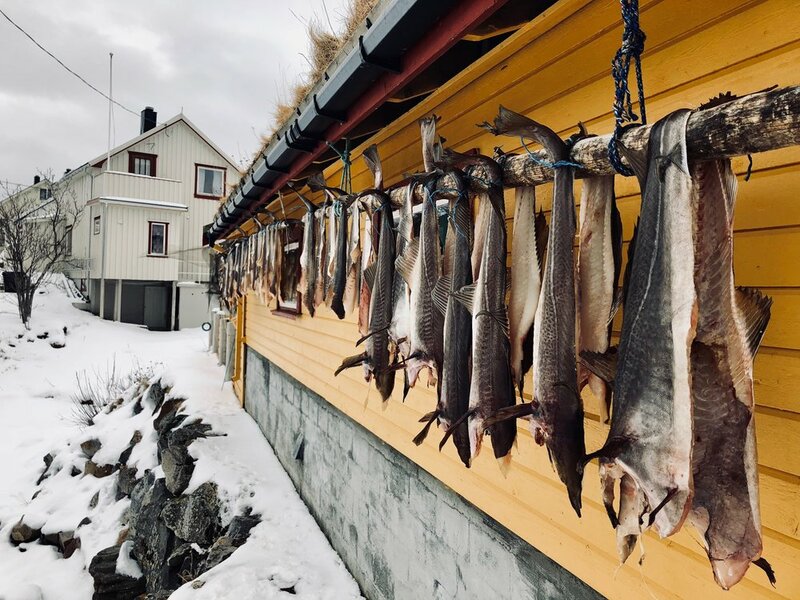 During the day, you are encouraged to do your own exploring or take part in one of the activities available: kayaking, hiking on the adjacent island, fishing for some arctic catch, or even just walking around the Manshausen Island itself can keep you busy for an afternoon. There are many fun finds on the island itself: the resident sheep population, seashells, and sunrises/sunsets which you'll remember for a lifetime. 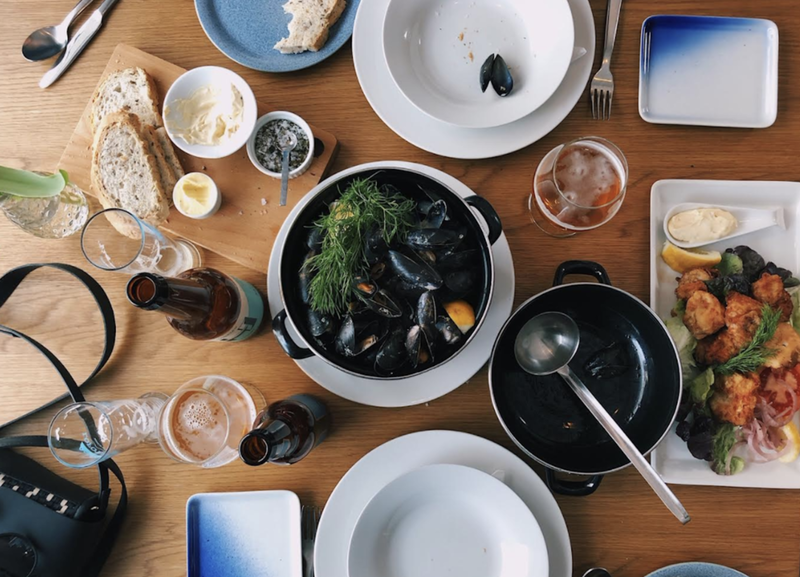 After a day of adventuring, you can either cook for yourself in your own cabin, or opt into an incredible meal with only the best ingredients sourced from the surrounding islands. The supreme immersion and belonging to everything local is exactly what I imagine the founder Børge Ousland had in mind when he came up with the idea to open Manshausen in the far reaches of northern Norway. A highly esteemed polar explorer, Børge spent years looking for a way to share the immense beauty of arctic landscapes which he had come to love with normal folk. Quite the quest, coming from a guy who said his marital vows at the North Pole. The search for such a place turned out to be an adventure in itself. Børge didn’t find Manshausen overnight. It took years of travel, a bit of luck, a chance meeting with the eventual architect, and some convincing – as any new venture usually does. But throughout, Børge’s paramount aspiration was to create a place where humans and nature could exist in harmony. Minutes after an Arctic seal surfaced in the water right underneath our cabin, I watched one of the largest sea eagles imaginable soar overhead. I looked out at the Lofoten Islands in the distance, and inhaled the Barents Sea. Did Børge succeed? You decide.